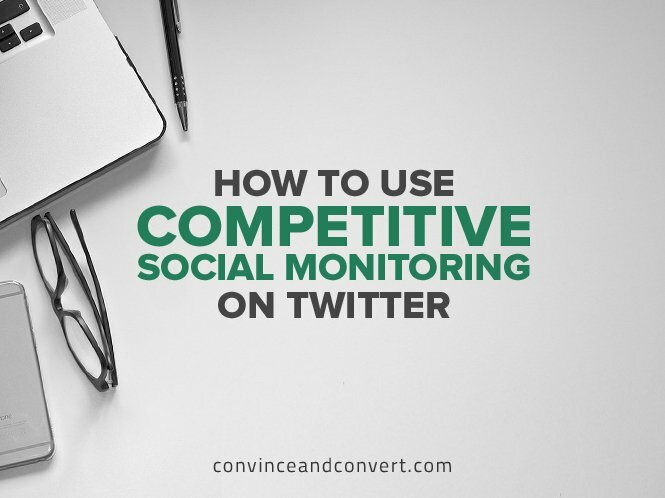 The power of competitive social media analysis is not the awareness of every tweet or post. Rather, the true power comes from the trends you find by aggregating data to extract patterns. Many, if not most, companies broadcast every initiative they’re executing. From whitepapers to webinars, from eBooks to events, if it is happening, it will show up on social media. By gathering competitive social data, you’re gaining insight into all your competitors’ digital marketing. Further, combine what companies say about themselves with what others are saying about them. Now, you’ll get a full view of their marketing activities that are actually making an impact. In concrete terms, mentions you earn are often a strong signal of marketing success. The same applies to your competitors. Of course, no single tweet can expose a pattern of success. Rather, a broad collection of tweets mentioning a particular initiative is a strong sign of effectiveness. 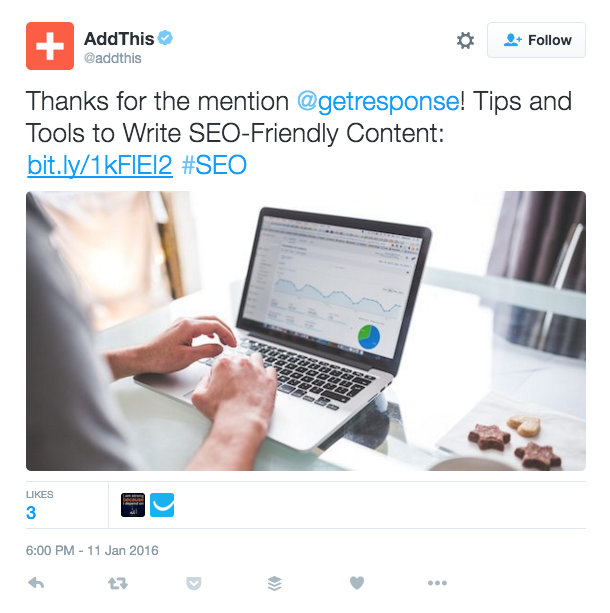 Here’s how to mine Twitter mentions for marketing opportunities. We’ll learn what works for your target audience and who is realizing results. It’s an easy way to find strategies that have been battle tested by your competitors. Since performing this analysis requires a large amount of data, we’ll need a tool to help us get the job done. In this post, I’ll use Rival IQ, a digital analytics tool that tracks the social media and SEO activities of you and your competitors. You could also automate the collection of this data using a tools such as Zapier and Google Sheets. Learn more about how from RazorSocial here. We’ll use email marketing software companies as our example market in this post. Using data from the last 90 days, we’ll examine over 12,000 mentions to find successful initiatives. If you want to play along at home, get your own copy of this landscape in Rival IQ. Here’s a look at the specific companies we’re analyzing. The first step in this analysis is to find which companies are worth examining. The first criteria is that they receive many mentions. The second is that they receive outsized mentions when compared with their Twitter audience. Begin by looking over the last 90 days. This is enough time to yield enough data to show patterns while still being recent. In our example landscape, MailChimp is the far and away leader. They have more than three times the number of mentioners compared to the next two companies, Constant Contact and GetResponse. We should also pay attention to companies that receive more mentions than their audience size might indicate. Emma stands out in this category, while also being in the top half of the list by total potential reach. When I dig in to a company, I first scan the list of mentions sorted by potential reach. I’m looking to identify the key activities behind the tweet, since a mention is usually a response to some other activity. As I start to see a collection of tweets that mention the same event/post/activity, I’ll jot down a note. By the time I reach the end of the list, I usually have three or four key activities that are driving the mentions—things like: whitepaper, blog, webinar, event, study, survey, PR, partnership, announcement, fundraising, launch, etc. Once I have my list for each company, I can step back and look at the list to find patterns of success. I compare these lists to my own list of activities, revealing clear opportunities to expand my marketing efforts. Let’s get started analyzing these email marketing companies! MailChimp, based in Atlanta, is the most established player in the email marketing space, but their marketing is anything but dated. The MailChimp marketing team keeps things fresh with a diverse set of activities that nurtures and grows their existing base. 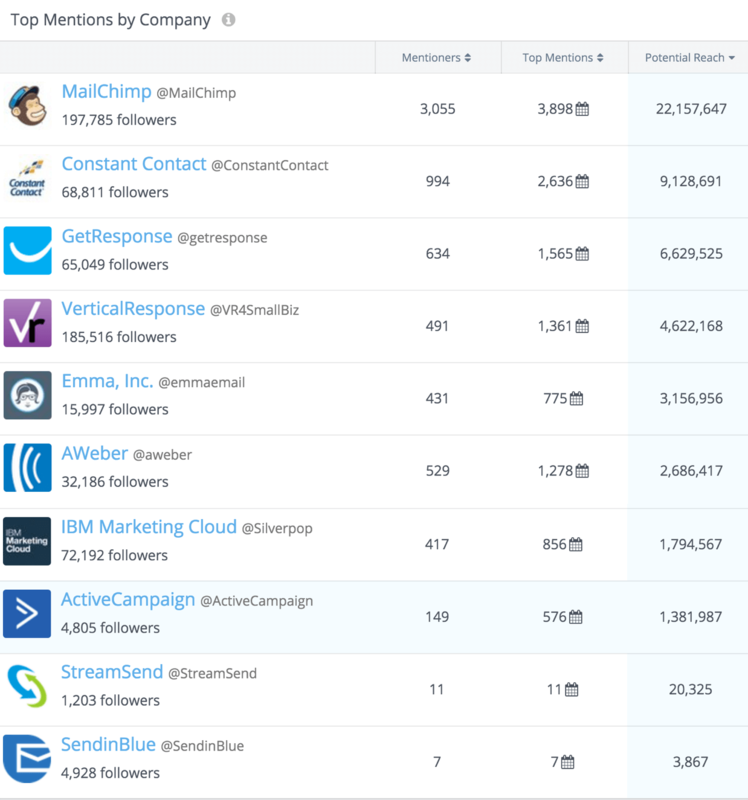 A quick scan of MailChimp’s Top Mentions reveals that their top seven mentions come from another marketing tool vendor, Hootsuite. 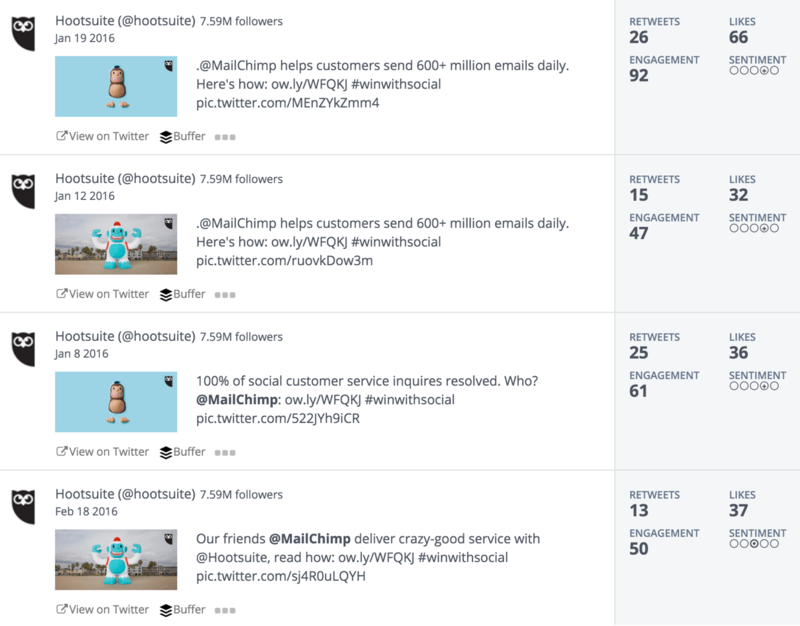 Examining the first tweet, we see that the Hootsuite mention is marketing a case study focusing on how MailChimp delivers good customer service. The other six tweets share the same study, and each of the seven tweets earn another 20 retweets on average. Do you have a service you love whose help has grown your business or made you more profitable? Consider reaching out to them, offering a testimonial, interview, or quote. Case studies are a great way to showcase customer success, and the visibility is good for both parties involved. After that, three of the next five top mentions were about MailChimp’s Annual report, a data-fueled look at MailChimp’s year. Releasing a year-end report gives a behind-the-scenes look into what and who drove your business last year. It’s always a crowd favorite! Expanding your reach means finding an opportunity to get attention from a new audience resembling your own. It’s a good thing for you that other companies are also looking to get broader attention. 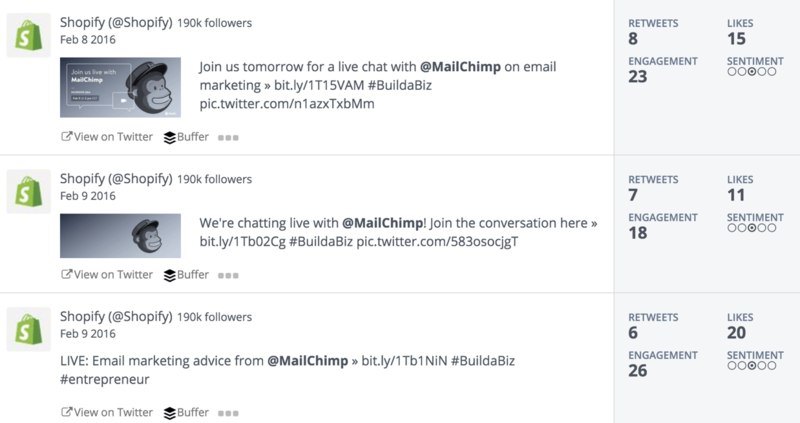 In this next set of mentions, MailChimp found a webinar partner in Shopify. MailChimp provided content while Shopify hosted, and each company got positive outcome from the interaction. So much of the work we do today focuses on digital marketing with fully measurable campaigns, but most would admit that real-world encounters are still the most fulfilling type of interaction out there. It might be challenging to meet your customers in person, but there are other ways to connect in the physical world. To create that physical connection with customers, MailChimp sent holiday socks (branded, of course). I’m sure MailChimp’s physical gesture generated a positive response through loyalty and word-of-mouth promotion. 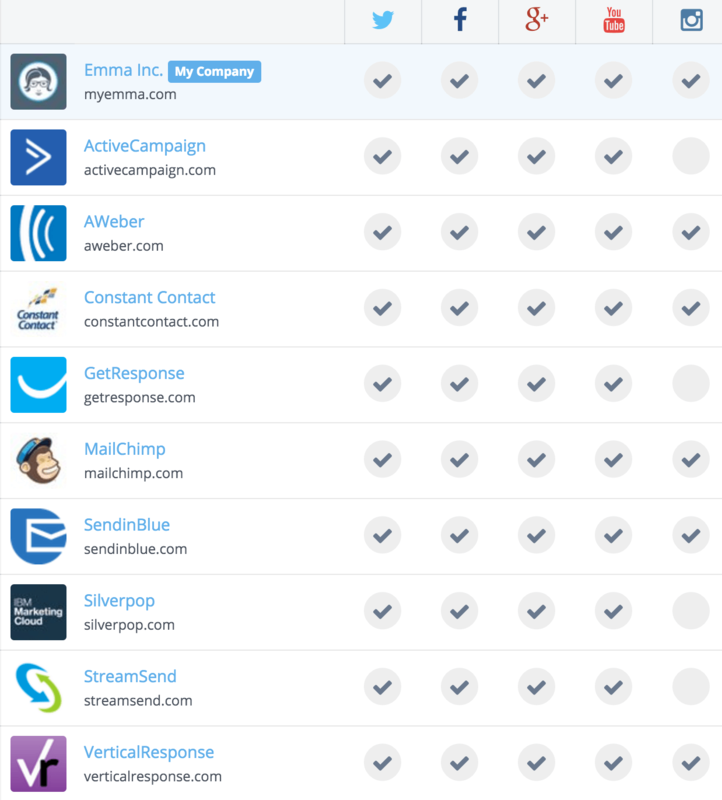 Like MailChimp, Emma is an email marketing platform whose target audience is marketers from all sizes of business. Examining their mentions for the last 90 days, you walk away with the impression that Emma has a focused, talented marketing team. Their influencer marketing game is strong as well. In this section, take note of the companies and brands that are sharing the Emma story. Emma was on hand at the Digital Summit, Phoenix event in February, and they were hanging with all the cool kids. Note the use of the #marketingunited hashtag by Ann Handley. She’s giving Emma extra love as they prepare to host their Marketing United conference in April. While hosting an event is an expensive, time-consuming feat, attending an event is an easy way to build relationships in real life. If you’re investing in an event, of course you’ll do lots of marketing to attract attendees. In this example, an Emma partner, Unmarketing, shared the results of a pre-event contest. That partnership and sharing helped to broaden Emma’s reach. When it comes to your blog, it helps to remember that not every post needs to come from your own team. To give your audience diverse, helpful content, bring in an expert. A guest post from a partner brand or influencer can be a powerful way to access their audience. In this next set of Tweets, we see that Emma and Sprout Social teamed up in early February on a pair of initiatives. Through a webinar and guest post, each company got some attention from the other’s audience. Sprout Social hosted a webinar while Emma focused on email marketing. This helped expose Sprout Social’s social media audience to email best practices. 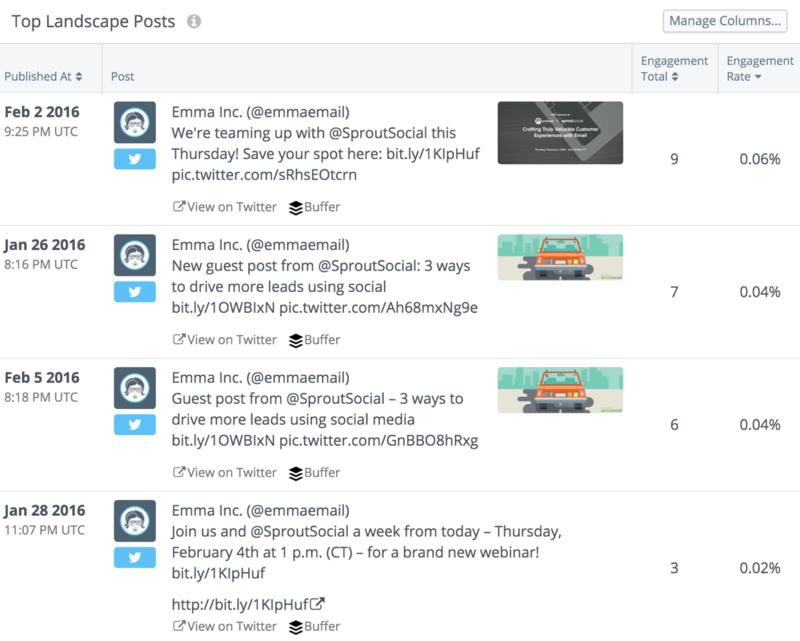 At the same time, Sprout Social wrote a guest post for Emma about increasing lead flow using social media. With this exchange and partnership, each company provided helpful content to a broader audience, and each benefited from the promotion of the other. Of course, Emma did their own promotion as well. 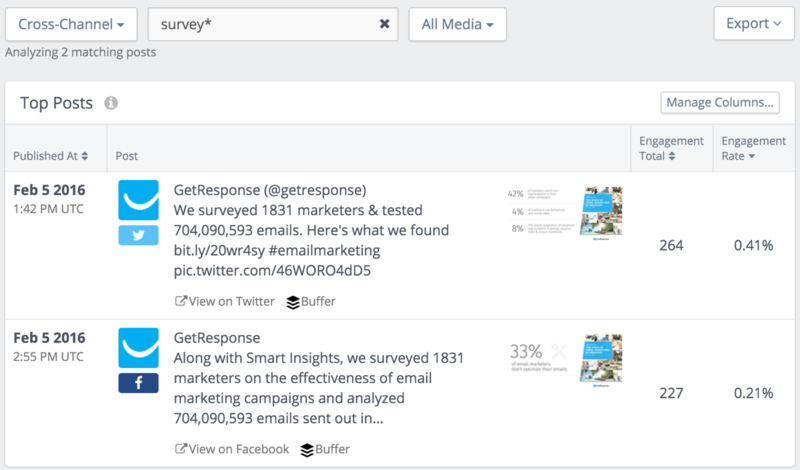 Other influencers got in on the action as well, including Convince & Convert! Emma is very active on the partnered webinar front. Even more of their top mentions come from other partnered webinars they’re doing soon, like this one with WordStream. GetResponse, based in Poland, is unlike the first two companies in this analysis. They focus on delivering simple email services to small business owners. As we examine their top mentions, we see less breadth of attention-grabbing marketing activity. Still, they’re gaining attention for more than just their basic content and blogging program. The top mention for GetResponse in the last 90 days comes from a blog post that mentions useful tools. In return, AddThis jumped on Twitter to say thank you. Sharing relevant resources and tools from others is a great way to give your audience an outside perspective. If you’d like to reach the audiences of whomever you mention in your article, reach out. Let them know you’ve mentioned them on Twitter. In addition, there’s no reason not to also write an email letting them know you’ve mentioned them and pointing them to the article. I don’t ask for a share of the article unless I have a relationship with the company or person, but your personal style might be different, so do what works for you. Being genuine tends to produce good results. The next set of mentions for GetResponse are all from their blogging efforts. People share their how-to posts covering marketing, social media, and email. Like Constant Contact, GetResponse knows that their small-business customers need more hand-holding than pro marketers. For them, that means covering areas beyond email marketing. As we continue, we see mentions of a GetResponse industry report, featuring responses to a survey along with data from 700 million emails. Note that the mentions of the survey are all actually mentions of a Marketing Land report of the survey. Searching more, I found only two social posts from GetResponse mentioning this study, and both posts received hundreds of interactions. I’m surprised to see such little social promotion. Perhaps that is part of the reason there aren’t more shares of this study. Data from Buzzsumo confirms that for this study, the MarketingLand piece got all the action, and not the study itself. The last company in our analysis is Constant Contact, and like GetResponse, they target small business owners. Their headline (currently) is “Be a Marketer.” This is different positioning than either Emma or Mailchimp take, and we see the results of that in their Twitter mentions. Almost the entirety of their top mentions are from sharing their blog content. Most of their content is of the “ways to,” “tips for,” and how to” variety. Constant Contact knows that consistent content that helps your audience improve their skills is a sure way to build a loyalty. Of course, sharing from customers and influencers in other spaces is a nice way to extend your reach as well. Both MailChimp and Emma earned additional reach by working with partners on a variety of content. In each of these examples, both partners benefitted from the exchange. Offer a case study to vendors you love (MailChimp). Host a webinar with a company in an adjacent space or provide content while they host (MailChimp, Emma). Exchange guest posts with partners whose audiences have overlapping interests with your own (Emma). As a product designer and marketer, I can tell you there is nothing better than exchanging smiles and handshakes with customers. Making a connection with people is why many of us work in this space, and those connections build relationships that are mutually beneficial. You’ll get increased loyalty, better feedback, and word-of-mouth recommendations. They’ll get even better products because you’re able to hear their points of view, in real life. Attend an event, and meet everyone you can (Emma). Host an event, and be the life of the show (Emma). Send a physical gift, a card, or a thank-you note (MailChimp). Every single company in this landscape blogs regularly which generates sharing activity. But there are other ways to invest your content marketing resources to get more from your investment. Write about things only you can write about. Share your behind-the-scenes perspective. People want to read unique content that teaches and inspires. Give them what they want. Share an Annual Report or Year in Review (MailChimp). Take a survey, analyze the data, and publish a report (GetResponse). Of the ten companies we analyzed, only two are running a breadth of attention-grabbing campaigns. There’s plenty to learn from MailChimp and Emma, but as other brands’ mentions reveal, there are passionate advocates of every company on this list. Your next step is determining the opportunity you’d like to seize. Make sure you’re aligned with your organization’s goals and brand, then push to make it happen. Seth is the founder of Rival IQ, a digital marketing analytics company in Seattle, where he leads marketing and product design. As a life-long data guy, Seth believes in the power of measurement to transform marketing.